I really enjoy baking and I always end up making excessive amounts for my teeny tiny household of two. Ordinarily, I would give the extra treats away, but this time I thought I’d transform them into another delicious dessert. In honor of a visit by two dear friends, (he’s British and she’s Italian American) and a handy basket of ripe blueberries in the fridge, I baked a batch of Blueberry Scones. Following the Rose Bakery recipe I ended up with 15 blueberry scones. My husband and I each enjoyed one and our two friends consumed a total of 4. All together that made 6. Now take that away from 15 and we are left with 9. Nine scones leftover for the very next day. But scones, as mentioned a day later taste a bit flat. Well… what to do? What to do? She nodded in agreement. Therefore two days later this is what I came up with. 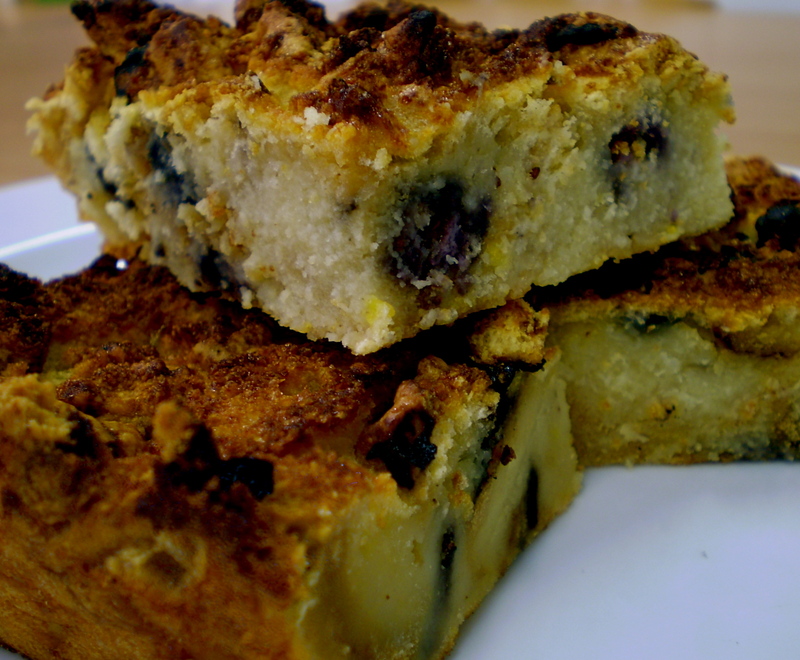 Optional: If working with plain scones, add raisins or currents and 1 tsp of cinnamon if you like. Heat oven to 180/350 degrees. In another bowl, combine the milk, cream, sugar and vanilla extract (cinnamon as well, if using). Beat the eggs separately and then add to the liquid mixture. Mix well. Then pour the mixture over the pieces of scones. Press bread down into the liquid mixture to make sure that they are well covered and soaked. Bake in the oven for 45 minutes. The top should look brown like toast.